Signed pots: "Lucy" and "Lucy and Richard" Lucy Martinez and her husband Richard Martinez (d) worked together - Richard typically did the painting. 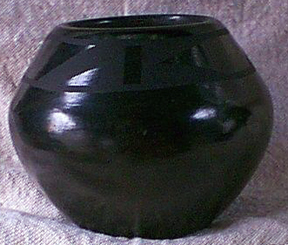 They were good friends of Maria and Julian and were part of the early black-on-black potters. She was active from 1930 -1980 and the mother of Alice Martinez.